"This is a great way to prepare halibut, cod, sea bass, or salmon. Serve it with couscous or rice." 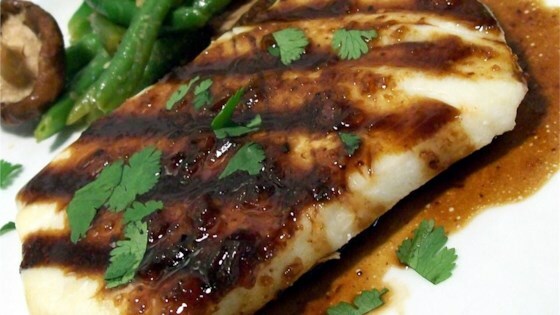 Simple grilled halibut topped with a flavorful rice wine and black bean sauce. Way too salty for us. Wow,this was great! What a wonderful sauce. Next time I will serve with rice so that we get every drop. Thanks Kathryn for sharing an easy and healthy recipe. Excellent!!!! Anyone who does not like fish, and those who love fish, will love this recipe. Great way to do something different with fish. Although I had to substitute sherry for the japanese wine, this is among the best fish recipes I have ever tasted.